“Let us examine them shall we? First the overhead air masks. If air masks drop from the ceiling I think the panic alone from such event should ensure at least one heart attack. That man over there for example. He doesn’t look too healthy. Then there are the life jackets. When the plane’s engines explode, it turns upside-down and plummets into the sea or smacks into the ground at 500 kilometers per hour, it is fondly hoped that we will reach down and pull out a flimsy yellow floating device literally out of our asses and calmly strap in on. 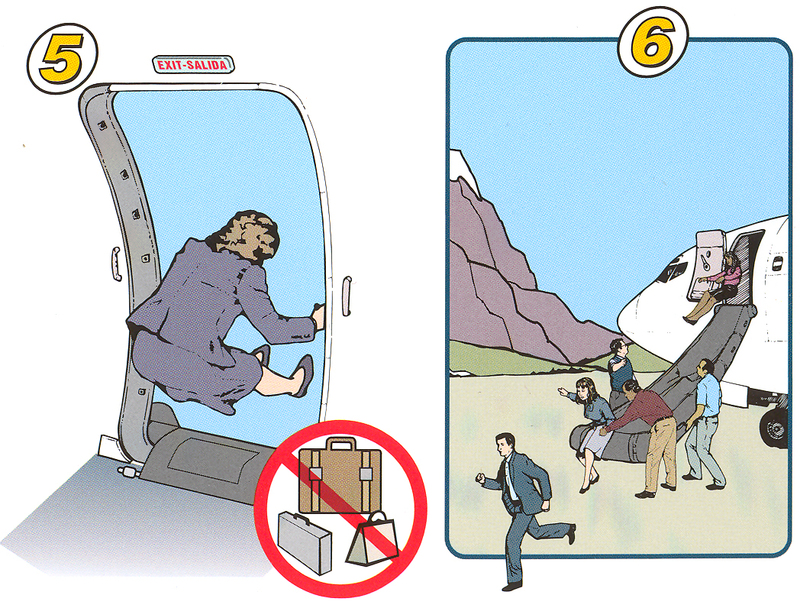 After that we have to get out of the emergency exit doors. I love those doors. Have you seen the instructions? Pull and lift handle, push out and pull in, LIFT DOOR ABOVE HEAD AND TOSS OUT.